After a slow start, the Town’s Channel Dredging and Dune Restoration Project is well underway. Weather issues, particularly in the north where much of the equipment for the project originated, impacted the start of the project. The attached maps show the status of the project both for dredging of Topsail Creek, and the sand distribution along the shoreline. Dune and beach restoration started at the south end of the island and is moving north towards the town limits. Time frames are best estimates and dependent on weather conditions. Please be aware that this is a major construction project and ask everyone to avoid the active areas at all times. The Town is still working towards our larger scale Local Project including a new dune structure and increased beach area. We have received permits from the State, and continue to work with other federal Agencies such as FEMA and the Army Corp of Engineers to secure all necessary permits and funding. Our goal is for that project to begin late fall/early winter 2019. A community meeting will be held in early May with more information. Just a reminder that tomorrow is the first Friday Bulk-Item pickup day. Vegetative debris and large household items will be picked up. Remember, construction materials and/or debris (such as lumber, decking, vinyl siding, etc. ), are not included in the bulk pick up and will NOT be collected. These items should be left at or near the area where regular trash is picked up. Please call Town Hall if you have any questions. Preparations continue for the Town’s Channel Dredging and Dune Restoration Project. The dredge is here and additional equipment (pipes, boosters, etc.) are on the way. The proposed project includes dredging Topsail Creek and some areas of shoaling in Banks Channel that will improve boating access and safety for our recreational boaters and commercial vessels. In addition, the beneficial sand removed as part of the dredging will be used to help repair the dunes damaged from the storm. This project will help get our dunes back to pre-Florence levels. Residents will begin seeing equipment and activity on the beach as early as next week, weather permitting. Activity for both the dredge and on the beach will start on the south end of the town and move north. In an effort to complete the project in a timely fashion, work will be ongoing 24 hours a day. Noise from the booster and the heavy equipment is an unfortunate impact of the project. Although every effort is made to minimize the impact of noise and lighting, please be aware that there will be times when equipment is in operation during the nighttime and early morning hours. We ask everyone to be aware that this is a major construction project and ask everyone to avoid the active areas at all times. While this project will help provide navigation benefits and restoration to our dunes, additional work to improve our beach will be necessary. Efforts are still underway to complete our bigger Local Project including a new dune structure and increased beach area. That project is scheduled to start late fall/early winter 2019. A community meeting will be held in the spring with more information.Look for weekly progress maps and updates on our website as work gets underway! For more information on these upcoming projects, please contact us at Town Hall. At the Board Meeting Wednesday night, the Commissioners voted to accept the bid from Cottrell Contracting Corporation to complete the planned Channel Dredging and Dune Restoration Project. The proposed project includes dredging Topsail Creek and some areas of shoaling in Banks Channel that will improve boating access and safety for our recreational boaters and commercial vessels. In addition, the beneficial sand removed as part of the dredging will be used to help repair the dunes damaged from the storm. The project will help get our dunes back to pre-Florence levels. Work on this project is already underway! The contractor has begun mobilizing and the dredge has arrived. Residents will begin seeing equipment and activity on the beach as early as next week, weather permitting. Activity for both the dredge and on the beach will start on the south end of the town and move north. We anticipate this work to be complete the end of March/First of April. The second, bigger nourishment project is planned for late fall – early winter. This project will involve dredging more of Banks Channel and Topsail Inlet and utilizing the sand to nourish our beach and provide greater protection from future storms. More information on this project will be sent out as it becomes available. Recently the North Carolina Department of Insurance announced that the North Carolina Rate Bureau filed a notice requesting an increase to Homeowners Insurance Policies on average of 17.4.% statewide. Actual proposed rate increases vary based on territory throughout the state. For Topsail Beach (within Territory 120) the proposed increase for homeowners caps at 30%, renter insurance 15%, and condominiums 15%. The proposal includes Homeowners Insurance Policies and Wind and Hail Policies. The Town of Topsail Beach and the Board of Commissioners strongly oppose this request, finding it extreme and unwarranted. The Board has adopted a Resolution in Opposition of the request and is forwarding its objections to the Insurance Commissioner. Attached is a copy of the resolution for your information. Now that the Town has completed the FEMA Contracted debris removal process, the Town will resume its Bulk Item Pick-Up Schedule starting this Friday, February 1st. Vegetative debris and large household goods are collected the first Friday of the month (first and third Friday between Memorial Day and Labor Day). This includes electronics and e-waste, appliances, furniture, mattresses and yard waste. • Vegetative debris must be in 4 foot sections or less to be collected. Also, yard waste should not be bagged, but piled near the edge of the street. Please remember vegetative debris pickup is designed for lawn clippings, leaves and trimmings of trees and shrubs, not for large or contracted projects. • Construction debris and material WILL NOT be picked up in bulk item collection. This includes: lumber, treated or painted, etc. ; pilings, decking and walkways; any material from new construction, remodeling or replacement/repairs; concrete cinder blocks and bricks; carpet, tires, sinks, toilets and doors. DRY paint cans will be picked up. • Items must be placed in front of the property along the street right-of-way. Please try to place them outside as close to the schedule collection date as possible. Please contact Town Hall at (910) 328-5841 or the Town website (www.topsailbeach.org) if you have any questions. Just a reminder that tomorrow (January 8th) is the last day to put out hurricane related debris from your property. Debris must be placed at the street edge to ensure it is collected by the Town's contractor. The trucks will start their final pass through Town tomorrow. Once the debris is removed from your street, debris collection and disposal will become the practical and financial responsibility of the property owner. Just a reminder that the Town of Topsail Beach is requesting that all hurricane related debris from your property is placed at the street edge no later than Tuesday, January 8,2019 to ensure that your debris is collected by the Town's contractor. After this date, once the debris is removed from your street, debris collection and disposal will become the practical and financial responsibility of the property owner. Town Hall will be closed on December 24th – 26th and on December 31st and January 1st in observance of the Holidays. Trash collection will operate on a normal Monday schedule, with pick-up on Monday December 24th and on Monday December 31st. The Mayor, Commissioners, and the Staff wish you all a Joyous Holiday and a Happy New Year. As we prepare for the Holiday Season, please note that the Town will be operating on a limited schedule. Town Hall will be closed on December 24th – 26th and on December 31st and January 1st. Trash collection will operate on a normal Monday schedule, with pick-up on Monday December 24th and on Monday December 31st. Please have a safe and happy Holiday Season! 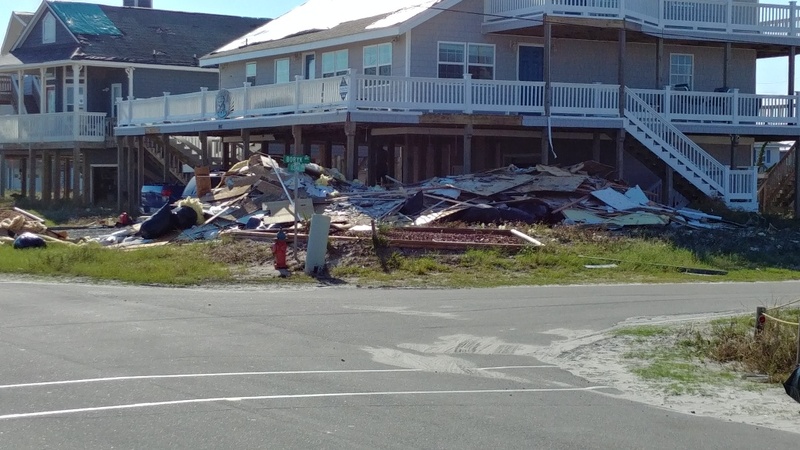 The Town's FEMA debris removal contractors have now collected more than 75,000 cubic yards of vegetative and construction and demolition (C&D) debris in Topsail Beach, and continue to operate in the Town as weather permits. Now this process is coming to an end. The Town is requesting that all hurricane related debris from your property is placed at the street edge no later than Monday, January 8, 2019 to ensure that your debris is collected by the Town's contractor (at no charge to you). Once the debris is removed from your street, debris collection and disposal will become the practical and financial responsibility of the property owner. Property owners who still need to gather debris on their property are encouraged to use the next few weeks to get it out by the 8th. Please note the debris contractor’s will not be working from December 23rd – January 2nd in observance of the Holiday Season. A major storm system is heading for the Carolinas this weekend potentially causing hazardous conditions throughout the state. Although we are not expecting a wintry mix here at Topsail Beach, we do anticipate a significant amount of rain that could lead to minor to moderate flooding on some of our streets. The National Weather Service is forecasting 2-3 inches of rain, with up to 4 inches possible, starting late Saturday through Sunday. Attached is additional information from the National Weather Service. Please be safe and use caution if you are traveling. The Town of Topsail Beach would like to thanks everyone who participated in and those who came to watch the 2018 Christmas parade this year. We had a record number of entries this year and a large turn out. Please check out our photo gallery to see the pictures of this year's parade. Thank you again! Please see the following Public Notice from FEMA regarding their intent to reimburse eligible applicants who sustained damage associated with Hurricane Florence. At last night's Board of Commissioners Meeting, the Board voted to lift the curfew that has been in place since September 12th. Please see attached the revised State of Emergency. The Town will be having a public hearing on the proposed changes to our current Land Development Code Ordinance on November 14th at 6pm at Topsail Beach Town Hall. Please click the following link to see a DRAFT of the proposed LAND DEVELOPMENT CODE ORDINANCE. The Town and its contractors are working hard to clean up the debris in the streets and on the beach. The Town is working closely with FEMA and the State to ensure we are following all required procedures. As you are aware, as of 7am this morning, the beach strand is now open. Although, we urge you to use caution as there is still debris on the beach and some may not visible. All of the soundside public accesses are open but not all ocean accesses are safe to use. Therefore, only the following ocean accesses will be open: Access #2, #2a, #8, #13, #16,#17, #18, #19 and #20. ​The ban on vacationers and short-term rentals has been lifted, but the curfew of 11pm to 7am remains in effect. The Town of Topsail Beach has revised it's State of Emergency for Hurricane Florence that will now allow for short term vacation rentals and open undamaged beach accesses. The Town does want to warn that there is still debris on the beach and on the streets and caution everyone to please be safe. Additionally, the curfew from 11pm to 7am remains in effect, damaged beach and sound accesses will remain closed until fixed and Bush Marina building and boat slips remain closed until repairs can be completed. The Pender County Health Department will hold a Flu Clinic at the Topsail Beach Town Hall on October 30th from 1:00 PM – 5:00 PM. If you bring your insurance card, you will not be charged at the time of the vaccination. Please contact Town Hall if you have additional questions. At last night's meeting, the Board REVISED the existing State of Emergency that has been in place due to Hurricane Florence. The revised State of Emergency lifts the ban on the general public to allow for daytime patronage to the local businesses and restaurants that are open. However, the curfew and ban on short term rentals/vacationers is still in effect. The beach and all public accesses(sound and ocean) remain closed, as does the Marina and boat slips. The boat ramp and Town Center will be opened. The Town has declared a State of Emergency effective at 8am this morning. Although we are not expecting a major event, it is important to remain vigilant during this time. Expect heavy rainfall and tropical storm force winds starting between 11am and 1pm. Please be sure to secure roof tarps and personal items that may be loose. The Town will continue to monitor the storm and its potential impact. The Town will begin to feel the effects of Hurricane Michael early tomorrow afternoon. We expect heavy rainfall and Tropical Storm force winds in our area. This is the time to secure your property, especially those structures that have existing damage from Hurricane Florence. Also, secure all loose items outside such as trash cans, deck furniture etc. The Town has received many inquiries regarding vacation rental reservations as we recover from Hurricane Florence. It is our goal to provide you with the most accurate information available. We encourage you to read the Vacation Rental Act (https://www.ncleg.net/EnactedLegislation/Statutes/PDF/ByChapter/Chapter_42A.pdf) in its entirety for your specific situation. Please visit the North Carolina Real Estate Commissions website (https://www.ncrec.gov) as their homepage has more detailed information on Hurricanes, evacuations and vacation rentals. You should also contact your rental agency directly for further information. Just a reminder that the beach, public accesses (both sound and ocean) as well as Bush Marina and the Town Center remain closed for safety reasons. The Town is continuing clean-up efforts from damage left behind by Hurricane Florence. Our debris removal company has started removing debris from the right of way’s and beach strand. This will be an ongoing process over the next month or so. We appreciate your patience during our recovery process. FYI - A staff member from Congressman Rouzer’s office will be available at Town Hall tomorrow from 9 am - 11 am. Topsail Beach Town Hall – 820 S Anderson Blvd. Share the Table will be at East Coast Sports Parking Lot is Surf City today 5-7pm with free cleaning supplies to anyone who needs them. answer questions on rebuilding on the ocean front. The Topsail Beach Post Office was damaged during Hurricane Florence and is currently being repaired. We hope to have a temporary location in Town within the next week. In the meantime, all PO box mail is being sent to the Holly Ridge Post Office. There is a window specifically for Topsail Beach residents to come pick up their mail there. The Postmaster is asking everyone to come pick up their mail as soon as possible. Those who have a mailbox will still receive mail delivery as long as the mailbox is upright and accessible. Just a reminder that before any repair work is done, you MUST obtain a permit from the Town. All fees will be waived. Also, all of Topsail Beach is located in a special flood hazard area (SFHA) and FEMA has special requirements for repairing properties in the SFHA. These requirements are mandatory, whether the structure is covered by flood insurance or not. Please refer to the following Flyer. Thanks to the strong efforts of our Volunteer Fire Department, the The Town was able to secure more roof tarps. They will be available at the Fire Department on Sunday starting at 9am with a limit of 4 per household. If you only received 2 today, you can get two more if needed. Thank you Topsail Beach Fire Department! SOLID WASTE AND DEBRIS UPDATE – Topsail Beach will resume regular household trash pick-up service on Monday, September 24th. Please place your trash cans away from any storm debris or vegetative piles wherever possible. As a reminder, our storm-related debris contractor will begin vegetative debris pick-up early next week and will continue pick-up periodically. Other debris, such as bulk items, electronics, hazardous waste, or Construction and Demolition (C & D)materials will be collected over the coming days and weeks. Please be sure to separate these items into different piles since they do not all go to the same landfill. According to FEMA regulations, any items placed in bags must utilize clear bags to identify the types of debris. Thank you for your help. If you have any questions, please contact the Topsail Beach Town Hall. The Town of Topsail Beach has received an additional 160 roof tarps, 20' x 25' in size, from the National Guard. These will be available to the public starting at 9am Saturday at the front door of the Topsail Beach Fire Department. Only two per household will be allowed. Please take only what you need. We hope to have more soon. The Town of Topsail Beach is currently only open to residents, certified general contractors and licensed insurance adjusters, the general public and short term rentals will not be allowed on the island until further notice. Please note that the curfew for those remaining on the island has been changed to 7pm-7am. Additionally, all public beach accesses are closed until further notice. The Town’s debris removal contractor will begin removing vegetative debris on Monday, September 24. Construction debris pick up will follow in the next coming days. Construction debris and vegetative debris MUST be separated according to the guidelines below. Make sure you place the debris in the proper location, within the street Right of Way, to ensure pickup. Below is a photo of the traffic pattern for those re-entering Topsail Beach and Surf City. All pass holders will follow the blue arrows and non-pass holders will follow the red arrows. Please make sure you have your re-entry pass or ownership documentation available prior to reaching an officer or staff member at the checkpoint. This will help eliminate traffic backup in these lanes. Please remember that if you do not have a re-entry pass you need to have proof of ownership and a valid ID. Please be patient with us as we work through this process. To clarify........Once the bridge opens in the morning, the entire Island will have a curfew from 7pm to 9am. This does not mean you have to leave the island, but if you choose to stay, you MUST remain on your property during the curfew. RE-ENTRY INFORMATION - If you do not have a pass, you will need to bring proof of ownership and your Driver’s License. Long-Term renters will need a copy of their current lease or proof of residency, such as a utility bill, and Driver’s license. Please note that phone service or internet has not been restored, but there will be Staff at the Town Hall during the day tomorrow to answer questions or help in any way they can. Water service has been turned on in Topsail Beach so if you have noticeable water issues, broken pipes or no water at all, you will have to self-report to Town Hall in person. The current Re-Entry pass looks like a blue label that came on your May utility bill with "2018-2019 RE-ENTRY PASS TOPSAIL BEACH" written on it. If you do not have this pass, you will need to bring proof of ownership and your Drivers License. Long-Term renters will need a copy of their current lease or proof of residency, such as a utility bill, and drivers license. The three towns on Topsail Island, Topsail Beach, Surf City, and North Topsail Beach, met on Wednesday, September 19th at 1:00 pm to discuss re-entry to the island. It was determined that all three towns will allow anyone with a re-entry pass or decal to the island, Thursday, September 20th at 9:00 am. Anyone without a re-entry pass or decal will be required to have proof of ownership and a valid ID. North Topsail Beach property owners that do not have a re-entry decal may use their driver’s license if it shows their North Topsail Beach address. Topsail Beach and Surf City pass holders are only allowed to access the island via the Surf City Swing Bridge. North Topsail Beach pass holders are only allowed to gain access via the North Topsail Beach high-rise bridge. Please be advised for those who choose to come back on the island, all utility services may not be restored. At this time the towns cannot guarantee emergency medical and fire assistance. Anyone with health concerns or challenges should reconsider re-entry until these services can be provided. There will also be an island wide curfew from the hours of 7:00pm – 9:00am that will be strictly enforced. For additional information and restrictions for each town, please follow their town Facebook page. IMPORTANT UPDATE - The Town of Topsail Beach will be open to property owners and residents ONLY, tomorrow (Sept 20th) at 9AM. The only access will be through the swing bridge in Surf City. You MUST have a Re-Entry pass/sticker. Those who do not have a re-entry pass/sticker, must bring proof of residency or something that identifies you with your property (such as a utility bill. electric bill, tax bill, etc.) and your driver’s license matching the name on the bill. Long term renters must have proper documentation of residency. Our fire protection system is still not activated however we are pleased with the progress made in bringing the system on line. Please continue to monitor our social media pages for further updates. Hello, thank you so much for your patience during this trying time. We know everyone is anxious to hear about our home. During a break in the storm, town staff was able to do a preliminary assessment of the damage. There are still areas of both Topsail Beach and Surf City with standing saltwater in the roads. Most of the damage to structures in Topsail Beach was limited to roofing, shingles and siding. We are certain that homes have experienced some flooding on lower level floors. Please not that a full assessment has not been completed, so some structures may have experienced more damage, however the overall impact was better than first feared. The dunes held up vey well overall. Breaches occurred near Smith Avenue and. Drum Avenue, but overall they withstood the storm. We did experience some damage to crossovers. Crew are being deployed to begin work on clearing debris and sand from the streets. Jones-Onslow electric and Duke Power are assessing damage in hopes to begin work very soon. As of now, re-entry to Topsail Beach and Surf City is prohibbitted, but we are working together to get everyone back to your homes. Good evening. Topsail Beach staff is continuing to work on assessing the damage resulting from Hurricane Florence. Unfortunately the storm is moving very slowly, making access to the island difficult. Our hope is to work with Jones-Onslow and Surf City to secure safe entry to Topsail Beach for our residents and property owners. Early today, staff was able to go to Topsail Beach for a preliminary review. There is debris on the roads and standing water in some areas making for difficult travel. Efforts are underway to restore power and make roads passable. Once this is done, we will have a clearer idea as to when Topsail Beach and Surf City can begin re-entry. We ask that you remain patient as we deal with the impacts of this huge storm. Our goal is the safety of our citizens and staff. As soon as possible, we will provide more detailed information. Hurricane Florence is still a dangerous threat to Topsail Beach and the region. We are working closely with Surf City and Pender County to assess the damage. We will continue to update you as the storm moves out of our area. 9/13/2018 10:30AM: The Topsail Beach Emergency Operations Center (EOC) has now been activated and is being manned throughout the storm. The phones will be answered as long as the storm allows. Updates will be posted on Facebook and the Website as well. The EOC is operating on a limited staff and we will do our best to answer as many calls as we can. Additionally, keep in mind that we will not have any information about the conditions in Topsail Beach until after the storm passes. 9/12/18 4PM: For your safety, we urge you to follow the mandatory evacuation order that went into effect at 8:00 AM this morning. There will be a mandatory curfew in effect for 7:00 PM this evening. Please note, water services will be disconnected as of noon on Thursday, if not before, until further notice. Emergency Services will also be suspended during the storm. Again, we urge you to comply with the evacuation order and take shelter in a safe location. The Town will continue to provide updates as they become available. 9/11/2018 2:30PM: Topsail Beach has a mandatory evacuation planned for 8:00AM on Wednesday, but we encourage all people to leave as soon as possible. The Highway Patrol will be available to assist with traffic and Pender County will have shelters open. A curfew will be in place at 7:00PM on Wednesday. Please heed the mandatory evacuation. Once the storm hits the area, emergency response will be impossible. Further updates will come as they are available. 9/10/2018 5PM: Topsail Beach will begin mandatory evacuations at 8AM Wednesday morning, unless conditions change. Please make your plans and secure your property in advance of the evacuation. We will send out further updates as they become available. 9/10/2018 12PM: The Town of Topsail Beach has declared a State of Emergency as of 9:00 this morning,September 10th, and a voluntary evacuation for the Town will be in effect starting at noon today. Persons with special needs should consider evacuating as soon as possible. We ask that you notify the Police Department for any assistance. As we continue to monitor the path of the storm pleased be advised that a mandatory evacuation is possible as soon as Wednesday morning. We ask that you take all the necessary precautions for the arrival of this storm. Secure all outdoor items such as trash cans and lawn furniture and take any measures necessary you can to protect your home from strong winds and possible flood waters. The Postmaster is requesting that you come by and pick up any packages and mail at the Post Office. It will be removed from the island if not retrieved. We encourage you to stay tuned to the weather forecasts and we will update you as more details on the storm’s path become available. Please monitor the Town's website and Facebook page for updates throughout the storm. 9/10/18 9PM: We are all busy preparing for the approaching storm. At this point no decision has been made as far as evacuation but we will post any decisions on our website and Facebook page as they come. Please take this time to prepare. If you do not have your re-entry sticker, anything that associates you with your property (ie. utility bill. electric bill, tax bill, etc. and your drivers license) will get you back onto the island. We are all busy preparing for the approaching storm. At this point no decision has been made as far as evacuation but we will post any decisions on our website and Facebook page as they come. Please take this time to prepare. The Town is seeking interested persons to fill one (1) vacant seat on the Planning Board. This board is an advisory board to the Board of Commissioners and items of business regarding zoning and land use may be referred to the Planning Board for recommendations. Appointment to the Planning Board are made by the Board of Commissioners. To obtain an application, please call or come by Town Hall 910-328-5841. Applications can also be found on our website at www.topsailbeach.org. Please take a few moments to fill out this short survey. Your response will help to build a better understanding of needs and priorities for cyclists and pedestrians in the Town of Topsail Beach. Even if you don’t walk or bike regularly, your feedback will be helpful. Your response will be anonymous. Thank you for your time! Looking to do something good for your community? Tired of seeing litter in your town? Enjoy coupons to local businesses? We might have a proposal that checks these boxes for you! The Four Towns (Holly Ridge, North Topsail Beach, Surf City and Topsail Beach) invite you to stop by one of our town halls, pick-up a pail & return it with litter. We want to thank the local businesses who are supporting this effort by supplying discounts for those who participate! Whiskey Tactical LLC. Carolina Decor & More Gallagher's Bar and Grill Ecological Marine Adventures Topsail Island NC The Daily Grind Surf City Shuckin' Shack Oyster Bar - Surf City NC. Let's get to work! This program runs from today until the end of the September. The Topsail Beach Board of Commissioners have a vacant seat, with a term expiring November 2021. Board Members will be considering potential candidates to fill the entire unexpired term at a meeting on August 27th, 2018. If you are a citizen and town resident of Topsail Beach and interested in serving as a Commissioner, please complete the Board and Committee Volunteer Application. Application can be found on the website at topsailbeach.org or at Town Hall, 820 S Anderson Blvd. Completed applications must be submitted to Town Hall by 5pm on August 23,2018. Please contact us with questions. It is with great sadness the Town announces the passing of Commissioner Tom Eggleston. Commissioner Eggleston was serving his second term and was an integral part of the Town Board. Commissioner Eggleston was devoted to Topsail Beach and provided great leadership and advocacy for the Town. He will be truly missed. Please keep his wife Rucker and his family in your thought sand prayers during this difficult time. The Swing Bridge is currently stuck and not passable, current time 4:40pm, and DOT is not expected to be able to begin maintenance for at least another hour. If you have to leave the island you are going to have to go to the North Topsail Beach high rise bridge until the repairs to the swing bridge are completed. Please plan accordingly. The Town is seeking interested persons to fill one vacant seat as an Alternate on the Zoning Board of Adjustments. This is a quasi-judicial board which hears and decides appeals from the decision of the Zoning Administrator in the form of variances and special use permits, for example. Applicants must be a resident of Topsail Beach. Appointment to the Zoning Board of Adjustments is made by the Board of Commissioners. To obtain an application, please call or come by Town Hall 910-328-5841. Additional copies are also available at Topsail Beach Town Hall. Contractors for NCDOT are finishing up the street resurfacing project, including Anderson Blvd., Banks Channel Court, Barwick Avenue, Canady Avenue, Drum Avenue, and Spot Avenue. During the week of May 7th – 11th work will include clean-up and minor repair as necessary, including spot work on the shoulder areas of the project streets. Although your property may not be affected, if you have an irrigation system within the shoulder of the street it is recommended that you have it clearly marked. Topsail Beach, NC--The Pirate Olympics have been postponed. Get your crew together for some swashbuckling fun when Pirates invade the Missiles and More Museum! July 17, 2018 at the Historic Assembly Building, 720 Channel Blvd. Pirate arts and crafts, Ship's Galley, Picture with a Pirate area, games and fun for the entire family! Walk the Plank, Dress like a Pirate Relay, Buried Treasure Hunt, Pirate Ship Races, Peg-leg Race and Capture the Flag and much more! At the request of many rental property homeowners, the Town has created a refrigerator magnet that highlights some of the ordinances that pertain to your guests during their stay in Topsail Beach. We do encourage you to make arrangements to pick one up to put on your refrigerator to ensure your guests are aware of our rules and regulations in order to have a fun and safe vacation. Per the new North Carolina General Statues, the Town of Topsail Beach has engaged a professional consulting firm, Rivers & Associates, Inc., to perform a Public Water System Development Fee Analysis. The analysis will use the calculation guidance provided by the State and the Town will use this study as the basis for setting the FY 2019 fees. Per State Statute, the study must be made available for public inspection and comment for 45 days prior to the new fees being adopted. The Town will conduct a public hearing to adopt the study on June 13, 2018. If you have any questions or comments relating to the Study, please contact Michael Rose Town Manager, at (910) 328-5841 or townmanager@topsailbeach.org. There will be a community meeting Thursday, April 19th for 5pm-7pm at the Surf City Community Center to discuss the updated scheduling of the new high rise bridge construction and how it will affect our community. Four-wheel drive vehicles possessing valid town permits shall be allowed on the beach strand at any time, 24 hours a day, during the period beginning at 12:01 a.m. October 1; of each year and ending at 12:00 midnight on March 31 or the Thursday before Easter of the next year (whichever is earlier). As you are aware, upon recommendation by DOT, the Board of Commissioners voted to lower the speed limit along Anderson Blvd at the January Board meeting. Please take notice that the newly posted speed limit along North and South Anderson Blvd. is now 35 MPH. NCDOT staff began changing the signs today and the new speed limit will be effective immediately. Bridge Work Requires Closure of the Intracoastal Waterway in Pender County Vehicular traffic will not be impacted. Carolina House Movers will be moving a large accessory structure on February 14th, from 1020 Ocean Blvd, through Topsail and off the Island. The move is scheduled to begin at 8:00 a.m. Although the size of the structure will not completely block the road at all times, this will still cause some traffic delays along Anderson Blvd as well as the roads leading through Surf City and North Topsail Beach. Please plan accordingly. We appreciate your patience. The Town of Topsail Beach Board of Commissioners is having their annual retreat on Tuesday, February 20th and Wednesday, February 21st, 2018 in the Town Board Room at 820 South Anderson Boulevard, Topsail Beach, N.C. starting at 9:00 am each day. Submissions for discussion ideas should be submitted to the Town Manager, Mike Rose at townmanager@topsailbeach.org or Town Clerk, Christina Burke at townclerk@topsailbeach.org. Submissions may be turned in at Town Hall as well. All submissions should be turned in by 5:00 pm February 16th, 2018. These ideas will be listed out and submitted to the board prior to their discussions. Please make sure to list your name, address, phone number, and email in case any clarification is needed regarding your concerns. Please contact Town Hall at 910-328-5841 if you have further questions. The phones at Town Hall and the Police Department are not working. We are trying to resolve the situation and hope to have them fixed soon. Town staff still has access to email. Should you have a Police emergency, please call 911. We apologize for any inconvenience this may cause and appreciate your patiencewhile we work to restore phone service. We apologize for the late notice, but it was brought to our attention that the Town’s trash provider, Tons of Trash, had unexpected difficulty in maneuvering the roads through Pender County to Topsail Beach this morning for the regular trash pickup. Therefore, the regular trash will be picked up Wednesday (January 10th). Also, remember the Bulk Item pickup (cancelled last Friday) will be done this Friday (January 12th). We apologize for the inconvenience and late notice, but as you can imagine, this snow and ice has presented challenges and delays for all of us. We appreciate your patience and thankfully we will all be able to thaw out with the warming temperatures expected this week. The bulk item pickup scheduled for Friday January 5th has been rescheduled to Friday January 12th. This reschedule is due to hazardous road conditions resulting from this past winter storm. If you have any questions please call Topsail Beach Town Hall when it reopens at (910)328-5841. We apologize for any inconvenience. Due to snow and icy road conditions from the winter storm, Town Hall will close for the day (Thursday January 4th). Town Hall will reopen Friday (January 5th) at 10 a.m. weather permitting. The closing is due to unsafe travel conditions for staff. Call the Police Department at (910) 328-4851 to report any problems or water emergencies. Please check the Town’s website (www.topsailbeach.org) for the latest information. The Town of Topsail Beach will be accepting Christmas trees for disposal for Residents and Property Owners ONLY. Trees can be dropped-off at the parking lot behind the Topsail Realty Building, located at 712 S. Anderson Street. All lights, decorations, garland or tinsel should be removed prior to drop-off. The Town of Topsail Beach has rescheduled it's regular garbage collection due to Christmas falling on a Monday this year. The regular garbage pickup that would fall on December 25th has been rescheduled to be picked up on Thursday December 28th. The regular garbage pickup will return to its usual schedule the following week and be picked up January 1st. The Town of Topsail Beach would like to thanks everyone who participated in and those who came to watch the 2017 Christmas parade this year. We had a record number of entries this year and a large turn out. Please check out our photo gallery to see the pictures of this year's parade. Thank you again! This is just a reminder that applications for any of the Town's boards and committees are currently being accepted. Many terms for board and committee members will end December 31, 2017 and the Board of Commissioners will be appointing any vacant seats in January 2018. If you or any one you know is interested in being considered for a position on a Topsail Beach board or committee please submit a completed application to Topsail Beach Town Hall. Applications will remain on file for any future openings as well. Carolina House Movers will be moving a house tomorrow, November 28th, from Shoreline Dr. off the Island. The move is scheduled to begin at 9:00 a.m.and will take approximately 2-3 hours. Please be aware, this will cause traffic delays along Anderson Blvd as well as the roads leading through Surf City. We ask that you please plan accordingly. The house move originally scheduled for tomorrow (11/15) has been CANCELLED. We will notify you of the new date once it’s been determined. The 2017 Town of Topsail Beach tax notices are now available. Please click the following link to look up you 2017 tax notice. The PDF is not necessarily in alphabetical order, therefore, you may want to use the search tool to find the specific property notice you are looking for. Properties can be located by last name or parcel number, physical addresses will not locate the property tax notice. If you have any questions please contact Topsail Beach Town Hall. Jones-Onslow EMC is steadfast in our efforts to deliver safe, reliable electric service to our members. In keeping with this commitment, plans and preparations have been made to relocate four transmission poles in the area where the new Publix is being built. In order to complete this process, we will need to have an outage on October 3, 2017, at 8:00 am. Power should be restored within three hours and every effort will be made to reduce the outage time even further. We have planned the outage during daylight hours to make the work go as fast as possible and for safer working conditions. In case of inclement weather, the outage will occur on Wednesday, October 4, 2017. The affected areas include Topsail Island from 9th Street in Surf City to the south end of the island including East Ocean Road from Holly Ridge south to the island. A reminder telephone call from our automated phone system will be made to you the day before the outage. Please ensure we have your correct phone number prior to this date. If we do not have your correct phone number, call 910-353-1940, have your account number handy and choose option 2, then listen to the instructions for updating your phone number. Thank you for your patience and understanding while this work is performed. Polls will be open November 7th from 6:30 am until 7:30 pm. Voters who are already registered need not re-register. Residents of the Municipalities who are not registered must register by 5:00 pm on Friday October 13, 2017 to vote in this election. Absentee ballots are allowed. Requests for an absentee ballot must be made in writing using a state approved form and be received in the Pender County Board of Elections office by 5:00 pm on October 31, 2017. One-stop early voting will be held in the Board of Elections Office at 807 S Walker St. Burgaw. Beginning on October 19, 2017 thru November 4, 2017. One-stop voting hours are Monday thru Friday 8:00 am until 5:00 pm and on Saturday November 4th from 8:00 am until 1:00 pm. For additional information contact the Pender County Board of Elections at 910-259-1220. Overview: Swells from hurricane Jose will begin impacting the area beaches Saturday and Sunday. This will create hazardous beach conditions including deadly rip currents. Otherwise, high pressure will prevail with highs in the lower to middle 80's and lows in the middle to upper 60's. Only an isolated shower is possible along the southeast North Carolina coast on Sunday. Impacts: High risk of rip currents is likely Saturday and Sunday at all area beaches. Also, navigation in and out of inlets will be difficult as high surf will be a significant navigation hazard. The Topsail Beach volunteer communications committee has released it's latest edition of the "Topsail Tides - Fall 2017". Please be sure to check out the cover article as it features useful information concerning the topic of beach nourishment that will be covered at the Community Forum being held this coming Saturday, September 16th, at 10 am at Topsail Beach Town Hall. We hope to see you there. The Town is continuing to monitor Hurricane Irma. Although it appears we are no longer under a direct hurricane threat, rip tide and gale force wind advisories have been issued for the area. Please be cautious of these advisories if you are planning activities on or near the water. The Town of Topsail Beach is closely monitoring Hurricane Irma. Although it is early to determine the direction of the storm, it’s a good idea to start preparing now for some type of impact. Secure all outdoor items such as trash cans and lawn furniture and take any measures you can to protect your home from possible floodwaters. These floodwaters could impact your ability to drive. If you have any medical concerns or special needs please plan accordingly. The Mayor will be making periodic phone calls to update you with any new information. If you would like to signup to receive these calls you can do so on the Town's website at www.topsailbeach.org. Just click on the orange and white Connect-CTY box and follow the prompts. If you do not have the pink re-entry sticker the Town sent out on the May utility bill, any other documentation that associates you with the property will work to get you back on the island in the event that it is open to property owners only. The BIS Committee will host a Public Forum on September 16th at 10:00 a.m. in the Town Hall meeting room. The Forum will cover information regarding the upcoming Beach Nourishment project. There will be a presentation and an opportunity for you to ask questions. We hope to see you there. Topsail Town Hall is currently experiencing telephone issues and our phone system is currently down. We are working with our telephone provider to rectify the problem. We apologize for the inconvenience. It is with great sadness the Town announces the passing of Commissioner Julian Bone. Commissioner Bone was serving his second term as Commissioner and played a very active role in Beach Nourishment. He will be truly missed. Due to Commissioner Bone's passing, tonight's Board Meeting will be postponed. We will notify you once a date has been chosen. Please keep his wife, Marie and his family in your prayers during this difficult time. You've spent month's planning a relaxing beach vacation. But you didn't plan on this one day of rain! Don't despair. Here are five suggestions of things to do when it rains on your Topsail Island vacation. Is sugar sabotaging you? Ready to make lifestyle changes that could impact your life? Kick sugar to the curb. Join us for a health and wellness workshop, "Breaking the Sugar Habit", on Tuesday, May 23rd from 6-8pm at CFCC's Alston Burke Center in Surf City. Local integrative health and wellness life coach Lynne Young will talk about how to prevent chronic disease, how to boost your energy, and how to take steps to eat and live healthier. You don't want to miss the opportunity to enjoy a healthier, happier summer. Register in person at the Alston Burke Center in Surf City or call 910-362-7930, or by visit. www.cfcc.edu/ce (course code#94699). Cost is $39. The North Carolina Department of Transportation will have Intermittent Lane Closures (alternating North and South) on the Surf City Swing Bridge starting April 9th - 12th and then continuing April 16th - 20th between 8pm and 5am for routine maintenance, weather permitting. If additional safety concerns arise, the bridge will be closed immediately for repairs. This night time work will allow new bridge construction to continue with no interruptions. Motorists will be directed by a flagger and portable message signs, with one lane remaining open at all times. Drivers are advised to use caution while traveling in the area, and expect delays. NCDOT reminds motorists to watch signs for closure information, stay alert and obey the posted speed limit. To obtain more information about this work, you may contact Ron Van Cleef, Bridge Maintenance at (910) 341-2000. Become financially independent. Save for retirement. Invest for the future. Learn basic investing terms, types, and strategies from an expert. Join us on Thursday, March 16, 2017 from 6-8pm at the Alston Burke Surf City Center. Seating is limited, so don't wait ~ For registration information call 910-362-7930 or www.cfcc.edu/ce using course code #90798. The Town of Topsail Beach is seeking someone to fill a seasonal part-time attendant position at Bush Marina from May through October, 2017. Applications can be picked up at 820 South Anderson Blvd., Topsail Beach, NC 28445 or can be found on our website at www.topsailbeach.org. EOE, High School Diploma/GED required. Valid North Carolina Driver’s License required. Open until filled. The Town is seeking interested persons for three (3) vacant seats on the Zoning Board of Adjustments. This is a quasi-judicial board which hears and decides appeals from the decision of the Zoning Administrator in the form of variances and special use permits, for example. CFCC Small Business Center - John Formica Seminar FREE! Here is the flyer that Jerry Coleman of our CFCC SBC would like to go around regarding the John Formica seminar in Hampstead on March 16th from 6-8p. This seminar is presented by a former Disney employee and he is well-known all over the country. If you have not seen John, please join us for this workshop. The registration link is provided. This is FREE for all who wish to attend. Anyone who works with customer service, restaurant, retail, business owner- big or small- will want to take advantage of this opportunity. The Town of Topsail Beach Board of Commissioners is having their annual retreat on Tuesday, February 21st and Wednesday, February 22nd, 2017 in the Town Board Room at 820 South Anderson Boulevard, Topsail Beach, N.C. starting at 9:00 am each day. Submissions for discussion ideas should be submitted to the Town Manager, Mike Rose at townmanager@topsailbeach.org or Town Clerk, Christina Watkins at townclerk@topsailbeach.org. Submissions may be turned in at Town Hall as well. All submissions should be turned in by 5:00 pm February 13th, 2017. These ideas will be listed out and submitted to the board prior to their discussions. Please make sure to list your name, address, phone number, and email in case any clarification is needed regarding your concerns. C.A.R.E Party - Casino Night! It's that time of the year again ~ Get your tickets for the CARE Party on Saturday, February 18, 2017. Need a Valentine idea, well here you go..take your lady or gentleman out the following Saturday for dinner, dancing, photo, open bar, and reverse raffle -$50 per person at the Topsail Assembly Building in Topsail Beach. Doors open at 6:30 and we will shut down at 10:30 pm. Grand prize is $2,000.00. Tickets may be purchased at the Chamber Office or online at www.topsailchamber.org, so if you would like to go, please get your tickets. All board of directors also have tickets to sell. This is for singles or couples. Evening attire - Game Tables will be on site. Come out and join the Greater Area Topsail Chamber of Commerce and guests for our annual event. It is a blast!! The Town of Topsail Beach Board of Commissioners will hold two public hearings; on Saturday, December 10, 2016 at 2:00 PM and Wednesday, December 14, 2016 at 6:00 PM at the Topsail Beach Town Hall to consider (1) a Town-initiated Zoning Map Amendment of all oceanfront property owners to include a new Oceanfront Protective Dune System Overlay District and (2) a text amendment to Division 6 (Zoning Districts and Regulations) of Article IV (Zoning) of Chapter 16 (Land Development) of the Town Code of Ordinances to establish requirements for the new overlay district. The proposed amendment will address building regulations required for the development of land, to the end of conserving the volume of sand within the protective dunes in the new overlay district. At its September regular meeting, the Planning Board voted to submit to the Board of Commissioners a draft text amendment prepared primarily by the Town Attorney and by the Town’s consulting engineer that provides for the new overlay district and regulations. The submitted text amendment includes text provisions suggested by the Planning Board, which also recommended that the Board of Commissioners take no action until FEMA approves the proposed revisions to the dune ordinance. More details, including a map of the proposed overlay zoning district, are available for public inspection during regular business hours at Town Hall. All interested parties are invited to attend. For more information contact Town Hall at 910-328-5841. The UNCW Students from the Cameron School of Business will be at Topsail Beach Town Hall on November 18th to present their business plan for the Marina. The presentation will be held in the Town Hall Board Room and will begin at 1 p.m. This presentation is open to the public. and put your jingle bells on. Saturday, November 26th at 6:30 p.m.
Saturday, December 3rd at 11:00 a.m.
and participate in our community activities. if you think you are going to participate in the parade. Permits are currently available for purchase at the Topsail Beach Police Department Monday through Friday from 8am - 4pm. During the weekend, until November 20th, permits are sold from 7:30am - 3:30pm at Bush Marina. After November 19th, permits will be available from 7am-12pm at the Topsail Beach Police Department by calling (910)259-1212. Jones-Onslow EMC has informed us that there will be a brief power outage this Friday, October 21 beginning at 2 pm. The outage should last less than 30 minutes. CFCC Alston Burke Surf City Center in Surf City will be a drop off location for the Disaster Relief Effort that is currently underway for those who have been devastated by the impact of flooding as a result of Hurricane Matthew. We are happy to announce that all roads in Topsail Beach are open, power has been restored and the Town is operating on a normal working schedule. We see minimal exterior damage to structures and no major escarpment on the beach strand. Topsail Island and the Town of Topsail Beach are accessible with minimum flooding on highway 50. There is considerable flooding along side streets, particularly, Bridgers Ave. and Carolina Blvd. A preliminary assessment of structural damage appears limited to shingles and siding. Jones Onslow electric is working to restore power. As the storm continues to approach the area, the Town is experiencing increased flooding on several of the local streets. Water levels in both the ocean and the sound are extremely high and are anticipated to rise even more as we approach high tide. The worst of the storm is expected to reach our area by early this evening and into the night. Forecasts still call for a significant amount of rain to go along with the rising water levels. The Town is monitoring the path of Hurricane Matthew. Recent reports suggest that the storm has shifted more to the north putting Topsail Beach under a Hurricane Warning. Flooding is expected with the highest rainfall and wind potential on Saturday as conditions steadily deteriorate. We are expecting 10” to 12” of rain from the storm which will result in significant flooding. Chances are greater for hurricane force winds for our area as well. PENDER COUNTY – The Pender County Office of Emergency Management will open two shelters today. Topsail Elementary and Burgaw Middle schools will open at 6p.m. The Town of Topsail Beach has declared a State of Emergency as of 10 a.m. this morning and a voluntary evacuation for the general public will be in effect starting at 9 a.m. tomorrow morning. If you intend to stay, be prepared to stay for a minimum of 2-3 days until the flood waters recede. If you are planning to leave and need information on local shelters please call Town hall or the Police department. The Town is continuing to monitor Hurricane Matthew. Possible evacuation plans will be decided as we get more information. It’s a good idea to start preparing now for some type of impact. Secure all outdoor items such as trash cans and lawn furniture and take any measures you can do to protect your home from possible floodwaters. The Topsail Beach Town Taxes are now available. Please use the following PDF to locate your name/parcel number and amount of taxes owed. Elections are coming up on November 8th. Early voting will begin October 20th and will continue until November 5th at One-Stop Locations. The deadline to request absentee ballots is Tuesday, November 1st at 5pm. The Town of Topsail Beach is continuing to monitor the track of Tropical Storm Hermine. The forecast is calling for conditions to deteriorate starting early Friday morning and the storm is expected to be out of the area by mid-morning Saturday.Estimated rainfall amounts of 4”-8” is possible, as well as some localized flooding. Winds of 35MPH to 45MPH are expected, gusting to 55MPH. Fort Fisher Outreach Program and Bingo Have Successful Years! The Town of Topsail Beach would like to thank everyone who contributed to and participated in both the Fort Fisher Outreach Program and Bingo sponsored by the Topsail Beach Historical Society. Everyone's hard work and participation made this year the most successful year to date. The Town sincerely appreciates the success of these programs and the contribution they bring to the community. Let's hope for even more successful years to come! TripAdvisor Vacation Rentals has compiled a list of “14 Beautiful Little Beach Towns in the US,” and Topsail Beach won first place by the reader's choice! You can find the full article here. All property owners NORTH OF DAVIS AVE can irrigate during the hours of 2 A.M. and 4 A.M. on Monday, Wednesday and Friday only. All property owners SOUTH OF DAVIS AVE can irrigate during the hours of 2 A.M. and 4 A.M. on Tuesday, Thursday and Saturday only. All in-ground irrigation systems using Town water must have rainfall cut off sensors installed, or must be manually shut off to prevent watering during active rainfall within any assigned irrigation time and day. Manual Watering with Town water for owners without in-ground irrigation systems is restricted to two (2) hours per day using the same addressing system described above. Any manual watering must take place between the hours of 5 A.M. and 10 A.M. during these assigned days. It is recognized that many homeowners without irrigation systems are unable to water during the week because they are only here on weekends. Thus, manual watering for two (2) hours on Saturday or Sunday is permitted between the hours of 5 A.M. and 10 A.M. There will be NO watering for the period between July 2-8. Starting Saturday July 9th at the CFCC Surf City Annex. The parking area at the end of Shoreline Rd. (Sound Access #1) will be closed Wednesday, June 29th for repairs. The repairs are expected to be completed by the end of the day. Please call Topsail Beach Town Hall at (910)328-5841 if you have any questions. ASBPA Recognizes Topsail Beach as One of the Country's Best Restored Beaches! With the beginning of the summer beach season a few days away, the American Shore and Beach Preservation Association (ASBPA) today released its much-anticipated annual list of the nation’s best restored beaches. This year’s list provides representation from the west, east, Great Lakes and the Gulf coasts. Do you have a friend, family member, or co-worker who is deaf or hard-of-hearing? Would you like to be able to communicate better with them? We can help! Starting June 14 to July 21 there will be evening classes at the Surf City Center on Tuesdays and Thursdays from 7-9pm. New Class Offered at CFCC - Smart Phones! In a world where almost everyone has access to the internet via a smartphone, do you find your 'smart phone' making you feel anything but 'smart'? The Town of Topsail Beach is seeking someone to fill a seasonal part-time attendant position at Bush Marina from May through September, 2016. Applications can be picked up at 820 South Anderson Boulevard, Town Hall, and Town of Topsail Beach, NC 28445 or can be found on our website at www.topsailbeach.org. EOE, High School Diploma/GED required. Valid North Carolina Driver’s License required. Open until filled. The "Topsail Tides" newsletter, written and created by citizen volunteers, town staff and chaired by a Town Commissioner, has released it's fourth edition. “Topsail Tides”—brings you the latest information about the Town of Topsail Beach. The Planning Board is requesting input and suggestions regarding the best use of the property donated to the Town located at 712 S Anderson Blvd. The Topsail Island Sea Turtle Project is looking for dependable walkers to help locate sea turtle nests on Topsail Island. This $19 workshop is designed to educate you about senior fraud prevention. You will learn why seniors are targets, what measures you can adopt to protect against fraud, and where to go for help if criminal activity is suspected. April 15 @ 10:00 a.m.
Do you have questions about planning for retirement and your healthcare after you retire? This could be the best $59 you spend for expert advice that will help you prepare your finances for retirement. Are you near or far? This workshop is for anyone who is 18 and older. March 1-24 on Tuesday and Thursday evenings, we will have MS Excel 2013- Introduction at the Surf City Center. For $80, you will become a confident user of Excel. Registration is open now! The Town of Topsail Beach Board of Commissioners is having their annual retreat on Thursday, February 11th and Friday, February 12th, 2016 in the Town Board Room at 820 South Anderson Boulevard, Topsail Beach, N.C. starting at 9:00 am each day. The Town of Topsail Beach will not be collecting used Christmas trees after the holidays to place at the toe of the dunes this year. Bulk item pickup has been rescheduled for Friday January 8th due to the New Year's Holiday. This is the pickup for household goods and yard waste, including Christmas trees. The "Topsail Tides" newsletter, written and created by citizen volunteers, town staff and chaired by a Town Commissioner, has released it's third edition. The Topsail Beach Town Hall and Fire Department have been asked, once again, to participate in the Community Christmas Assistance program by the American Legion Club of Hampstead. The Board of Commissioners is seeking applications by those citizens who would like to serve in this capacity. To obtain an application, please call (910) 328-5841 or come by Town Hall. Applications can also be found on our website at www.topsailbeach.org. Applications must be received by December 4th at 12:00 PM. Municipal Elections are coming up on November 3rd. Early voting started October 22nd and will continue until October 31st at the Board of Elections in Burgaw, located at 807 S Walker St. The deadline to request absentee ballots is Tuesday, October 27th at 5pm. The Town of Topsail Beach plans to reopen the beach to vehicles tonight at 7:30pm. The roads to Topsail Beach are open, although we would advise you use your own judgement and caution if your traveling. Due to possible inclement weather the Town is rescheduling bulk item pickup from October 2nd to October 9th. Flu shots will be available at Topsail Town Hall on October 15th between 10am-1pm. is offering several continuing education classes for this SUMMER 2016. Permits are currently available for purchase at the Topsail Beach Police Department Monday through Friday from 8am - 4pm. In an effort to gather feedback regarding the CAMA Land Use Plan, Topsail Beach is requesting you complete a short questionnaire. On August 12, 2015 the Topsail Beach Mayor and Board of Commissioners voted to amend the Town’s dog ordinance (Section 4, Article 2) in response to an increase of violations and civil citations. Starting Monday, Aug.17, at 4:30 a.m., and ending Friday, Oct. 23, the N.C.Department of Transportation will repair the fender system on the Surf City Swing Bridge on N.C. 210 that was damaged after being struck by a barge on July 19. The Town solicits sealed bids for the purchase of the Turtle Hospital Property (the“Property”) from the Town, pursuant to N.C.G.S. §§ 143-129 & 160A-268. Due to the first Friday in July falling on July 3rd the Town has decided to change our bulk item pick-up the the 2nd (July 10th) and 3rd (July 17th) Fridays in order to avoid increased traffic delays. The 2014 CCR Report on the drinking quality of the Town of Topsail Beach's water supply is now available. We are excited to announce the opening of Main Street Inn on Topsail Island! Please join us for an Open House on Monday, June 22 from 5:00-9:00 pm. Jennifer and Ryan are searching for a vacation home off the coast of North Carolina, but Ryan has his heart set on a stand-alone home for his family to make memories. Qualified applicants must be able to assess a fire scene, allocate resources as necessary and act as incident commander. Applicants must be willing to be a member of an interior fire attack team. The Town is currently accepting Bids for the sale of the Turtle Hospital Property. The parcel includes all of Lot 5 in Block 15 of New Topsail Beach Subdivision as shown on a map recorded in Map book 3 at page 56 of the Pender County registry and is located at the end of Crews Street at 822 Carolina Boulevard in the Town of Topsail Beach. Bids for Construction Modifications of the Topsail Beach Town Hall Meeting Room will be received by the Town of Topsail Beach at the Town Hall. The Town will be providing residents with a hurricane re-entry sticker on their May utility bill. The hurricane re-entry sticker will be affixed to the top portion of the water bill. The Fireball Run, in its ninth season, is rolling into town Sept. 29-30. This year's theme is Space Race. The show will feature four international astronauts along with participants from commerce and industry. To learn more about Fireball Run, visit FireballRun.com. The Town of Topsail Beach hired Michael Moore as interim Town Manager to serve until a manager search can be completed permanently filling the position. Michael Moore served as Surf City Town Manager until he retired in 2013. TI Coastal conducted a conditional survey on March 24 and has reported the resulting bathymetric data of Topsail Inlet after the dredging project that has lasted throughout the winter. They report there is at least 10' of water at low tide throughout the entire system. On, Tuesday, April 7th, 2015 at 7:00 p.m. there will be a public hearing to seek public input regarding the potential implementation of paid parking for the Town of Topsail Beach with a private contractor operating the program. On, Wednesday, March 11, 2015 at 7:00 p.m. there will be a public hearing to consider a text amendment to the Town of Topsail Beach Zoning code Section: 16-244 Accessory Uses regarding hot tubs, pools and spa locations and requirements. This is the letter that property owners' in parts of the area of Scott Ave to north of Clark Avenue have received concerning the proposed changes to their flood zone and the Town’s option to oppose these changes. The "Topsail Tides" newsletter that is written and created by citizen volunteers, town staff and chaired by a Town Commissioner has released it's second edition. The Town of Topsail Beach Board of Commissioners is having their annual retreat on Thursday, February 12th and Friday, February 13, 2015 in the Town Board Room. On,Wednesday, February 11th, 2015 at 7:00 p.m. there will be a public hearing to seek public input regarding the potential implementation of a No Passing zone and reducing the speed limit to 35 mph from the Town Line to 100 feet south of Catherine Access only. The Town of Topsail Beach will be collecting used Christmas trees after the holidays and placing at the toe of the dune. The Town of Topsail Beach is allowing Verizon Wireless to construct a Tower at 820 South Anderson Boulevard. This is a monopole tower that will have three antenna arrays. The Beach will be closed to vehicles and limited access at some beach access cross overs until Monday, December 15th. Since the July 9th Town Board Meeting when Mrs.Pam Castens, the Army Corps of Engineers Project Engineer, gave an update Power Point presentation on the status of Topsail Beach's FEMA/Fall 2014 Project the Town has received a current timeline for the expected dredging progress that will beginning this week. The Topsail Island Shoreline Protection Committee, The Town of Topsail Beach Mayor and Board of Commissioners invite you to attend the December 11th, 2014 TISPC meeting at the Topsail Beach Town Hall on 820 South Anderson Boulevard at 2:00 pm. The Town of Topsail Beach will hold a Veterans Day Flag Ceremony at 11 a.m. on Tuesday November 11th. There will be a watercolor painting class offered from Cape Fear Community College at the Surf City Community Center starting October 28th. On Tuesday, October 28th, 2014 at 2:00 P.M. in the Topsail Beach Board Room at 820 South Anderson Boulevard, there will be a hearing on a variance request by Amy and Cowan Johnson 504 North Anderson Boulevard. Flu Shots Available at Town Hall Oct. 7th between 10a.m. and 1p.m. Tuesday, October 7th, 2014, The Pender County Health Department will be administering flu shots from 10:00 am until 1:00 pm. Special Called Meeting and Public Hearing October 25th at 11 a.m.
Emma Anderson Memorial Church has requested that the Town of Topsail Beach close the portion of Carolina Blvd. (State Road 1558) between Scott Avenue and King Street. The Planning Board has one (1) opening for a member. This board is an advisory board to the Board of Commissioners and items of business regarding zoning and land use may be referred to the Planning Board for recommendations. The Town of Topsail Beach has been provided a Power Point Presentation from the N.C. Division of Marine Fisheries and The Department of Natural Resources that explains the many factors that may affect water quality reports. Dottie and Herb Netherton would like to thank all the locals and tourists who helped make Topsail Beach's "Pillage in the Village" a success in its second year. The Town of Topsail Beach will be selling beach driving permits through the Topsail Beach Police Department this year. The Town of Topsail Beach Board of Commissioners established a local committee comprised of board members and three ex-officio members to study and recommend action in regards to maintaining and protecting the Town’s Beaches, Sound waters and Inlet. September is Brain Aneurysm Awareness Month! There is a new animation available depicting the concept of the new high rise bridge that is to replace the swing bridge that is currently in Surf City. State recreational water quality officials today lifted a water quality swimming alert at a sound-side site in Pender County. A swimming alert has been issued for Beach Access #S-1, which is located at the end of Shoreline Dr. This may be caused from storm water runoff due to excess rainfall. The Town of Topsail Beach is inviting North Carolina licensed and experienced Engineers and accompanying NC licensed surveyors to submit qualifications to perform construction management on the Town of Topsail Beach FEMA Phase II Nourishment Project. National Resources Defense Council has dubbed 35 popular beaches around the country as our Superstars! Out of a list of hundreds of popular beaches nationwide studied over several years in consultation with state officials, NRDC's Superstar Beaches are those that did not exceed the previous national standard between 2009-2012 by more than 2%. Additionally, those beaches also did not exceed the EPA's new, more protective water quality threshold, the Beach Action Value (BAV), by more than 2% in 2013. On, Wednesday, August 13, 2014 at 7:00 p.m. there will be a public hearing to consider a text amendment to the Town of Topsail Beach Zoning code Section: 16-590 Temporary Signs Sub Section (a) Paragraph (6) regarding temporary signs. The Town of Topsail Beach is now making available the opportunity for people to donate to the Town Center. The Town has provided a itemized donation tier available for individuals or groups to donate a certain amount for a particular item in which they can be recognized or designate in honor or memorial of another person. Of course anonymous donations will be accepted as well. Donations can be made through Topsail Beach Town Hall. If you have any questions please contact us at (910)328-5841. Surf City's fireworks display has been postponed for Thursday. The new display date is going to be the 29th of August. The Friday before Labor Day. We are monitoring the storm and anticipate winds and associated rain to occur Thursday evening and be out of our area by Friday Morning. At this time we anticipate a great 4th of July weekend. Currents will be affected by the storm and we urge beach goers to be mindful of rip currents as the storm approaches and while it is passing. We will keep you updated and urge you to keep an eye on the weather. This report is prepared by TOWN OF TOPSAIL BEACH, public water system I.D. 04-71-020 on April 16,2014, is a snapshot that covers the period of January 1st through December 31st 2013. Due to the 4th of July Holiday being on Friday Bulk item pickup has been rescheduled for Thursday July 3rd. This will not interfere with Thursday's regular household trash pick-up. The Topsail Beach Volunteer Fire Department has received their fire rating after completing a recent inspection. The Town of Topsail Beach rejected all Bids for construction of a Town Center Bathroom Facility on May 19th, 2014. The Town Newsletter Returns as "Topsail Tides"! “Topsail Tides”—brings you the latest information from the Town of Topsail Beach. Bids for construction of the Town Center Bathroom facility to be furnished and installed in the Town of Topsail Beach will be received by the Town of Topsail Beach at the Town Hall. The Public will take notice that the proposed budget for the Town of Topsail Beach for fiscal year 2014-2015 has been filed with the Town Board. On Wednesday, April 9 at 10 p.m., the N.C. 210 bridge over the Intracoastal Waterway in North Topsail Beach will close as apart of the on-going rehabilitation work, weather permitting. At the Town of Topsail Beach’s request, UNCW faculty and students have been investigating the possibility of paddling trails for the marshes of Topsail Island. On Wednesday, April 23, 2014 at 7:00 p.m. there will be a public hearing to discuss the possible adjustment in Marina Fees regarding seasonal and non-seasonal charges. On,Wednesday, April 23, 2014 at 7:00 p.m. there will be a public hearing to discuss the application of minimum water rate fees per unit for condominium complexes. Jones Onslow has a planned power outage for all of Topsail Beach starting at 9am on March 11th. The outage should last no longer than 2 hours. On,Saturday, March 22, 2014 at 11:00 a.m. there will be a public workshop to review proposed designs and layouts for the Town Center Park element. Bids for cleaning Town of Topsail Beach municipal buildings and offices will be received by the Town of Topsail Beach at the Town Hall, 820 South Anderson Boulevard, Topsail Beach, N.C. until 2:00 P.M. (EST), Friday, April 18th, 2014 and then at said office publicly opened and read aloud. Bids for Maintaining Town of Topsail Beach Water Storage Tanks and will be received by the Town of Topsail Beach at the Town Hall, 820 South Anderson Boulevard, Topsail Beach, N.C. until 2:00 P.M. (EST), Friday, March 28st, 2014 and then at said office publicly opened and read aloud. On Saturday, March 1st at 11:00 am, there will be an organizational meeting of the Paddle Trails Friends Group in the Town Board Room at 820 South Anderson Blvd. The Town of Topsail Beach recently had it's annual board retreat in which the current Board discussed some of the main topics of concern for the upcoming year. Insurance Companies Request Rate Hike for Homeowners Policies. Due to ongoing improvements to the utilities in the Queens Grant Subdivsion area it will be necessary to shut the water down tomorrow, Thursday January the 9th from 10:00 am to approximately 1:00 pm. The Town of Topsail Beach will be collecting used Christmas trees after the holidays again this year and placing at the toe of the dune. 820 South Anderson Boulevard, Topsail Beach, N.C. The retreat is from 8:30 am to 4:00 pm each day. The Town of Topsail Beach would like to thank everyone who participated and supported this year's Christmas parade despite the inclement weather. We hope you are considering participating in the 10th Annual Christmas Parade at Topsail Beach. I hope that you will enjoy yourselves as you provide entertainment for this community gathering. If you are bringing a vehicle to be in the parade, please decorate it in the Christmas spirit. The Town of Topsail Beach is seeking a qualified contractor to perform dredging in Topsail Inlet with placement of material on the developed portion of Topsail Beach. The Town of Topsail Beach Parks and Recreation Advisory Committee is currently conducting a survey regarding aspects of recreation needs to gage the current need for types of activities and programs that residents would enjoy. There will no longer be an attendant available at Bush Marina starting October 28th. The ramp will still be open 24 hours a day with an honor box for fees. Slip rentals and beach passes will be available through the Topsail Beach Town Hall Monday through Friday from 8pm to 5pm. If you have any questions please call (910)328-5841. Your Cooperative is making renovations to the Topsail substation located at 14245 NC Highway 50. This renovation will provide additional dependability for the station. It will also update transmission lines which are in excess of 30 years old. These lines are the sole source of power to the Topsail and South Beach substations which serve almost 6000 customers. This work requires a power outage and it has been scheduled for Tuesday, October 29, 2013, beginning at 8:30am. All members should have power restored within three hours. In case of inclement weather, the outage will occur on Wednesday, October 30, 2013. This outage will affect all consumers in the Town of Topsail Beach and in the Surf City area along Roland Avenue and New River Drive to the Surf City town limit. It will also affect the areas of Little Kinston and members along NC Highway 50 from the draw bridge to the Food Lion shopping center. Thank you for your patience as we continue with improvements such as these to provide you with reliable electric service. On Wednesday October 23, 2013 Iseler Demolition will be onsite to tear down the old water tank. During demolition all of Crews Ave and a portion of Carolina (between Crews Ave and Ward Ave) will be closed. Access to the Turtle Hospital for employees will be by foot only during the demolition. The demolition is expected to be completed in one day. The roads will be open again as soon as possible. Show your support for the foundation by clicking the following link and signing the petition. www.bafound.org Choose Get Involved and then follow the prompts to contact Congress and then select Take Action. The Brain Aneurysm Foundation is the world's only nonprofit organization solely dedicated to providing critical awareness, education, support and research funding to reduce the incidence of brain aneurysm ruptures. This will aid in the assistance to declare September as National Brain Aneurysm Awareness Month!! Lt. George Perkins of the Wilmington Police Department is coming to Topsail Beach to talk with kids and adults about the rules of bicycling on public roads, helmet* regulations, and bicycle safety in general. which is: AN ACT TO FACILITATE THE DEPLOYMENT OF MOBILE BROADBAND AND OTHER ENHANCED WIRELESS COMMUNICATIONS SERVICES BY STREAMLINING THE PROCESSES USED BY STATE AGENCIES AND LOCAL GOVERNMENTS TO APPROVE THE PLACEMENT OF WIRELESS FACILITIES IN THEIR JURISDICTIONS. The Public Hearing will be in the Board Chambers at 820 South Anderson, Town of Topsail Beach Town Hall. This Public Hearings is to receive any input or comments on the proposed ordinances. The proposed ordinance changes are available at Town Hall between the hours of 8:00 am and 5:00 pm for review. On, Wednesday, October 9th, 2013 at 7:00 p.m. there will be a public hearing to review proposed changes to the Town’s Zoning Code to name the Town Planning Board as the Parks and Recreation Advisory Board. The Town of Topsail Beach Planning Board and Town Center Steering Committee will hold a Public Workshop at Town Hall on Saturday September 21st, from 9 am - noon. The purpose of the workshop is to receive public input related to a Comprehensive Parks and Open Space Plan and the Proposed Town Center Park Plan. On, Wednesday, August 28th, 2013 from 3:00 to 5:00 p.m. there will be a public hearing to review the parking and landscape plan for the new elevated water tank across from Town Hall. The U.S. Fish and Wildlife Service is releasing the estimated cost and economic impacts of its proposal to designate terrestrial critical habitat for the Northwest Atlantic population of loggerhead sea turtles in coastal areas of six southeastern U.S. states. The Town of Topsail Beach is now pre-selling tickets for our 50th Anniversary Celebration Dinner. Bids for the landscaping and parking lot work for the new Elevated Water tank site to be furnished and installed in the Town of Topsail Beach will be received by the Town of Topsail Beach at the Town Hall, 820 South Anderson Boulevard, Topsail Beach, N.C. until 2:00 P.M. (EST), Friday, July 26th and then at said office publicly opened and read aloud. 50th Anniversary Celebration August 31st! Come join the celebration at the Assembly Building! The NCDOT Bridge Maintenance Unit will be utilizing lane closures for maintenance to the drive system. Eastbound and Westbound lanes closed intermittently. Bridge #16 Surf City Swing Bridge NC50/NC210 .4 Miles N of Junct NC210 Over Intercoastal Waterway. June 23rd through June 26th from 9:00pm until 5:00am. The 2012 CCR Report on the drinking quality of the Town of Topsail Beach's water supply is now available. The Town of Topsail Beach has decided to make the 50th Anniversary Banners available to anyone who would like to purchase this piece of memorabilia after our 50th Anniversary Celebration. The banners will be available in a written auction style bidding with a $50 minimum bid. Bids must be received by September 9, 2013 and winners will be notified on Oct 1, 2013. Requests should be submitted to the Topsail Beach Town Hall in a letter with "50th Anniversary Banner Bid" written on the outside of the envelope. Shipping and handling will be at the auction winners expense. There are currently 30 banners available or auction. Please contact the Topsail Beach Town Hall at (910)328-5841 with any questions. 2012 WATER SYSTEM IMPROVEMENTS: The project is in-service and nearing final completion. The Town Hall Facility was placed in-service on May 02, 2013 and the Humphrey Street Facility on May 24, 2013. The elevated storage tank was put in service on June 06, 2013. The customer data-base was set up and training for the automated meter reading system completed by May 08, 2013. The Public will take notice that the proposed budget for the Town of Topsail Beach for fiscal year 2013-2014 has been filed with the Town Board. A copy of the proposed budget is available for public inspection in the office of the Town Clerk, 820 South Anderson Boulevard, Monday through Friday, 8:00 a.m. - 5:00 p.m.
A public hearing on the proposed 2013-2014 fiscal year budget is scheduled to be held on Wednesday, June 12, 2013 at 7:00 p.m. in Town Board Room, 820 South Anderson Boulevard, Topsail Beach, North Carolina. At the hearing on June 12, oral and written comments will be received from any interested citizens. Anyone planning to attend this meeting who will need services to accommodate speech, hearing or visual impairments, should call the Town Clerk at 910-328-5841one week in advance of the meeting so appropriate arrangements can be made. Due to a waterline break there is an outage of water service from 458 N Anderson Blvd. to the town line. Crews are working hard to restore service within the next 2 - 3 hours. We apologize for any inconvenience this may have caused. “Come Pillage in the Village” is the whimsical motto of the summer plunder days craft market being held this summer in downtown Topsail Beach. The craft market will take place every Thursday from 10 a.m. to 4 p.m. all through June, July and August. It is located at the start of the downtown district on the corner of S Anderson Blvd and Davis Ave.
On Wednesday, May 8th, Carolina Movers will be moving a house from 1612 Carolina Blvd to Surf City between the hours of 9 a.m. and noon. Please be aware, this will cause traffic delays along South and North Anderson Blvd, as well as the roads leading through Surf City, so please plan accordingly. The Reel Housewives of Topsail Island is holding their 3rd annual Breast Cancer Bike Ride Saturday April 20, 2013 starting at 9am on the South end of the island at Serenity Point and will finish in North Topsail Beach. There are 126 participants in this ride and we encourage all citizens to be aware of this event to help ensure the safety of all the participants. Additionally, please plan for travel delays while driving on the island for most of the morning. Rain date for the bike ride will be Sunday April 21, 2013 at 9am. There will be a workshop on April 25, 2013 at 2 p.m. in the Town Hall meeting room, regarding changes to the Town’s Flood Plain Development Ordinance. The purpose is to hear input from State, Local officials, Community Rating System Officials, engineers, Insurance agency representatives, building contractors, real estate industry representatives and property owners regarding the proposal to increase freeboard from 1 to 3’. The exercise classes offered at the assembly building will now be continued throughout the summer. Classes begin at 9am on Wednesday mornings. This class is open to the public (residents and visitors) and to all fitness levels. Come join the fitness fun with Freddie! NOTICE - Tank Coating and Containment Specialists, Inc. will begin sandblasting and painting operations on the elevated water tank located at the corner of South Anderson Blvd. and Crews Ave. This process is anticipated to last through the first week in May. If you have any questions or concerns please contact Ted Vargo at (828)734-6714 or Patton Bradford at (205)533-5864.
" We thank all who attended our town's birthday party and making it a success. More than 200 people attended, which exceed our expectation for this event. We also thank our town employees and committee members/supporters who worked to ensure we all had fun celebrating the birth of our town. Sincerely, Topsail Beach 50th Anniversary Committee"
Starting the month of April the minimum fee for water usage will increase to $30 a month. The water rates will remain the same. Additionally, The Town of Topsail Beach will be changing from quarterly to monthly meter readings and billing. Therefore, if you have water service in the Town of Topsail Beach you will be receiving a bill in the beginning of April for the months of January, February and March with the minimum monthly rate of $15 ($45 for the quarter) and your quarterly usage. Beginning the month of May you will receive a monthly bill with a minimum rate of $30 plus your monthly usage. If you have any further questions please contact the Topsail Beach Town Hall at (910)328-5841. A Special Call Meeting has been scheduled for March 6th at 3pm at the Topsail Beach Town Hall. Freddie King will be offering open excercise classes at the Assembly Building starting Febuary 20th at 9am. House moving between 9am and 12pm on January 30th. Expect travel delays on Highway 50 during this time. One of the two lanes will be closed on the Surf City Bridge from February 3rd and 4th. 50th Anniversary Committee seeks more volunteer members. The Town of Topsail Beach will be collecting christmas trees to be placed at toe of dunes. The Town of Topsail Beach is currently considering the development of a Town Center that would be located on the corner of South Anderson and Hines Ave. Recently a letter was sent to all Topsail Beach property owners that included the Town Center proposal and an opinion survey. For more information please contact Topsail Beach Town Hall at (910)328-5841.